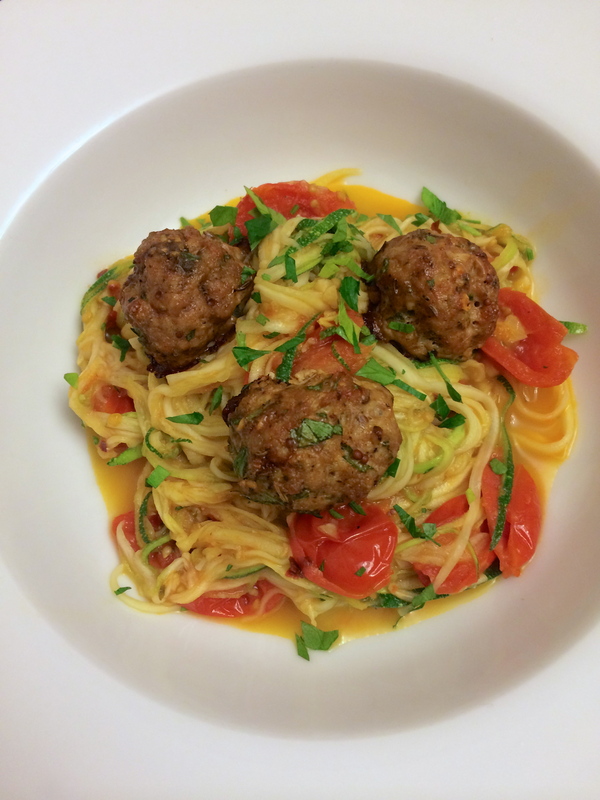 I can’t say enough good things about these tiny little meatballs. I have been trying to eat much cleaner which is always more time consuming, usually more expensive and sometimes less flavorful than the “good stuff” but these are SO yummy! 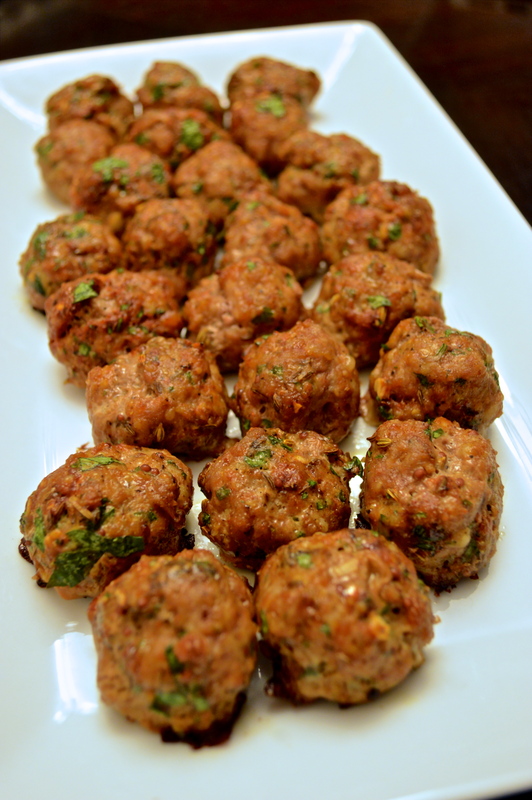 The cool part about these is that they’re miniature sized (only a tablespoon of meat each) so you can feel like you’re eating more and they’re a much healthier version of a beef meatball. 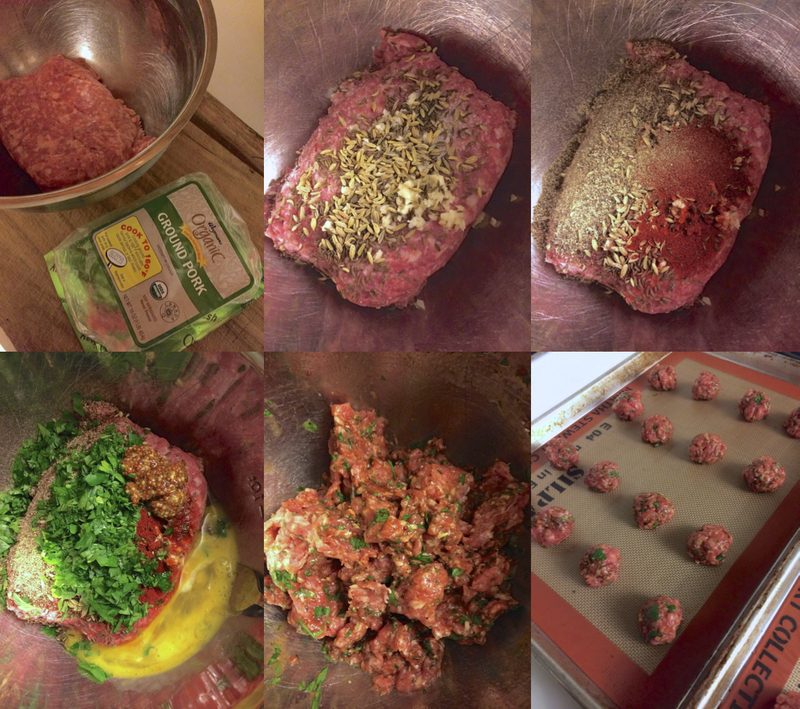 I used organic ground pork, which gets flavored with garlic, spices, mustard + herbs. These are super easy to make, they make a lot + can be frozen so these are an awesome plan ahead recipe!These are yummy as a pre-workout snack with some of my greek yogurt dill sauce + hummus or, make my zucchini pasta and add these to the dish! 1. Put 1lb of organic ground pork in a large bowl. Preheat oven to 400 degrees and line two baking sheets with foil or silpat mats. 2. Add two cloves of minced garlic, 1 tsp caraway seeds + 1 tsp fennel seeds to the pork. 3. Add 1/2 tsp salt, 1 tsp ground black pepper + 1 tsp paprika to the bowl. 4. Add one large egg that’s slightly beaten, 1 tsp whole grain dijon mustard + 1/4 cup fresh chopped parsley to the mix. 5. Use your hands to mix everything together. 6. Measure out 1 tbsp portions and roll into balls. If you wet your hands and shake off excess water before rolling, it makes the pork less likely to stick to your hands. Bake in the oven for about 20 minutes, until the pork is 160 degrees. Preheat oven to 400 degrees, line two baking sheets with foil or silpat liners. Put all ingredients in a large bowl. Use your hands to mix everything together. Measure out 1 tbsp portions and roll into balls. Bake in the oven for about 20 minutes, until the pork is 160 degrees. Awesome! Can’t wait to make them. Where do you find organic ground pork?? Our local grocery store chain, Wegman’s, has organic ground meats so that’s where I got it! Thanks! I’ve never even heard of Wegman’s so obviously not a MT, ID, WA area type of chain. It’s such a great grocery chain… don’t know what I would do without them! Do you guys have a Whole Foods or Sams Club? I know you can get it there! We do have a WholeFoods; I will check next time I’m there. Meanwhile I will make them with turkey burger. Thank you so much!! mmmmm would love to make this! Thanks for this recipe! Looks great, need to make a run to the store to get a few ingredients, then will try! You’re welcome!! They’re so easy to make and so yummy, hope you like them!